Winner of the 1996 American Book Award and the Oliver Cromwell Cox Award for Distinguished Anti-Racist Scholarship Americans have lost touch with their history, and in this thought-provoking book, Professor James Loewen shows why. 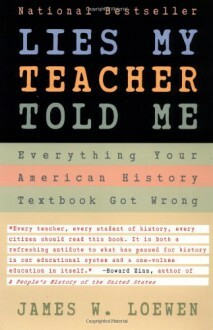 After surveying twelve leading high school American history texts, he has concluded that not one does a decent job of making history interesting or memorable. Marred by an embarrassing combination of blind patriotism, mindless optimism, sheer misinformation, and outright lies, these books omit almost all the ambiguity, passion, conflict, and drama from our past. In ten powerful chapters, Loewen reveals that: The United States dropped three times as many tons of explosives in Vietman as it dropped in all theaters of World War II, including Hiroshima and Nagasaki Ponce de Leon went to Florida mainly to capture Native Americans as slaves for Hispaniola, not to find the mythical fountain of youth Woodrow Wilson, known as a progressive leader, was in fact a white supremacist who personally vetoed a clause on racial equality in the Covenant of the League of Nations The first colony to legalize slavery was not Virginia but Massachusetts From the truth about Columbus's historic voyages to an honest evaluation of our national leaders, Loewen revives our history, restoring to it the vitality and relevance it truly possesses. Probably more interesting if you're from the US, Irish textbooks probably suffer from similar problems.